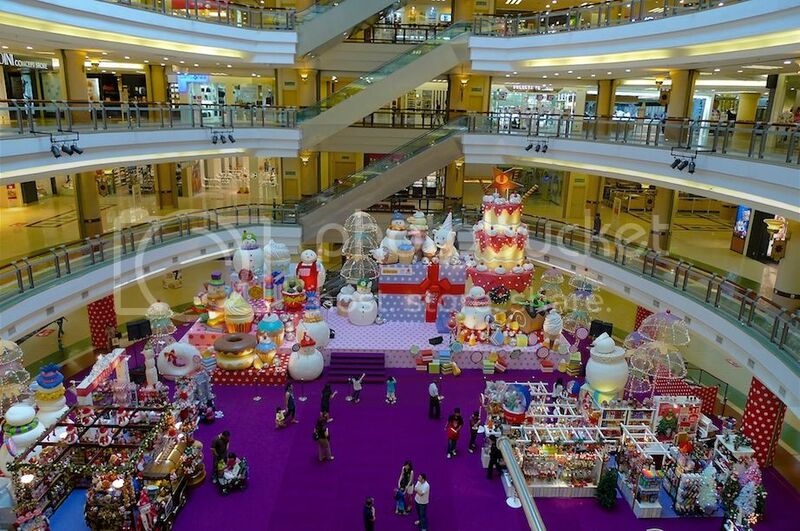 The Christmas decorations in Klang Valley this year were all pretty good. 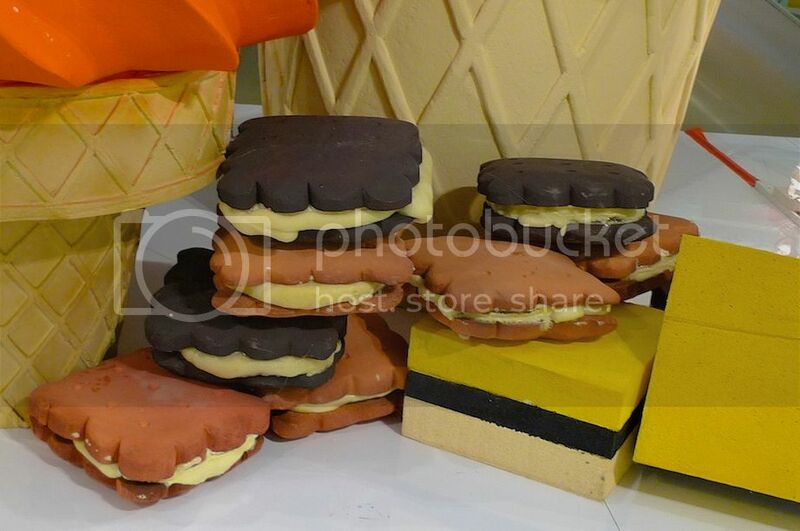 In fact, I dare say they were better than the ones I saw in Singapore. 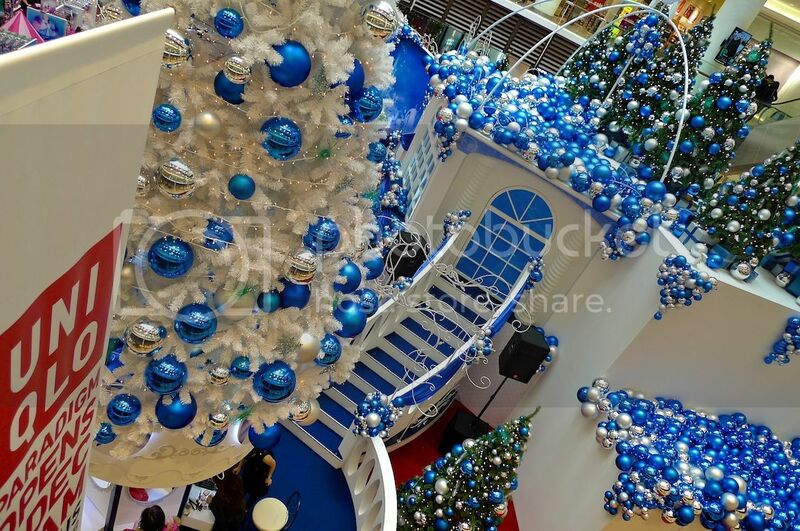 For the Christmas decorations in Pavilion KL, Farenheit 88, Starhill Gallery and Berjaya Times Square in Kuala Lumpur, check out Part 1. 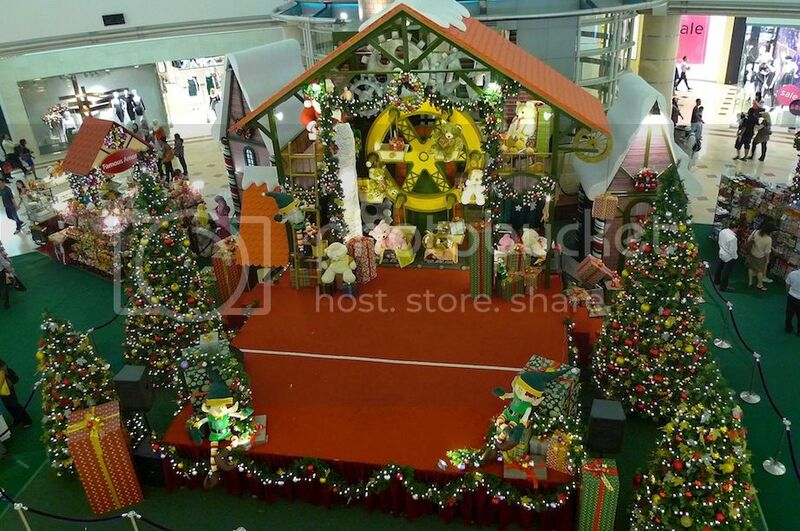 To see the Christmas decorations in 1Utama, Tropicana City Mall and Paradigm Mall in Petaling Jaya, click Part 2. 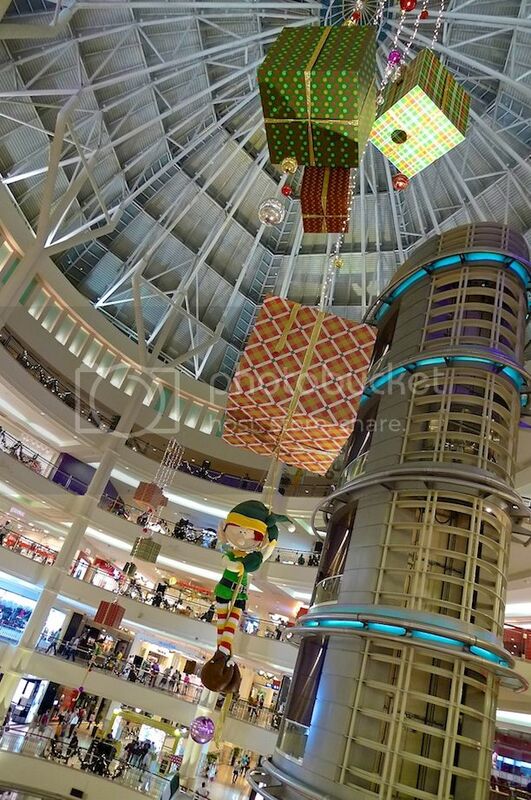 Part 3 continues with Sunway Pyramid. 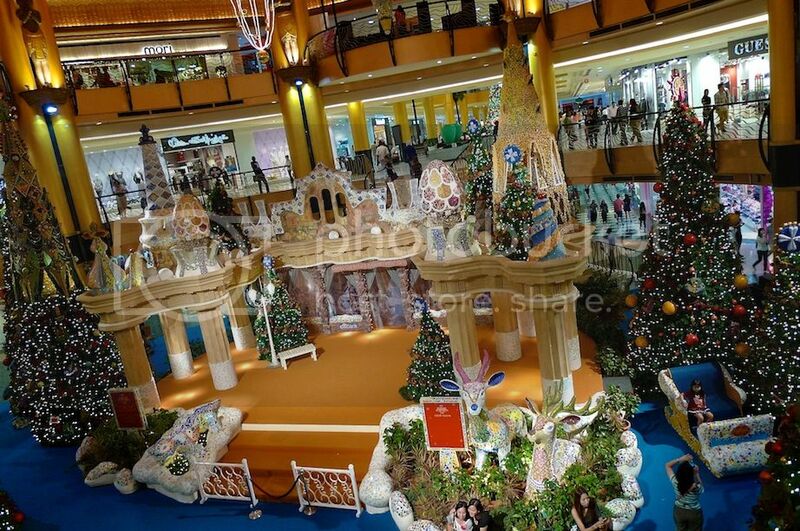 The theme for this year is 'An Enthralling Christmas'. 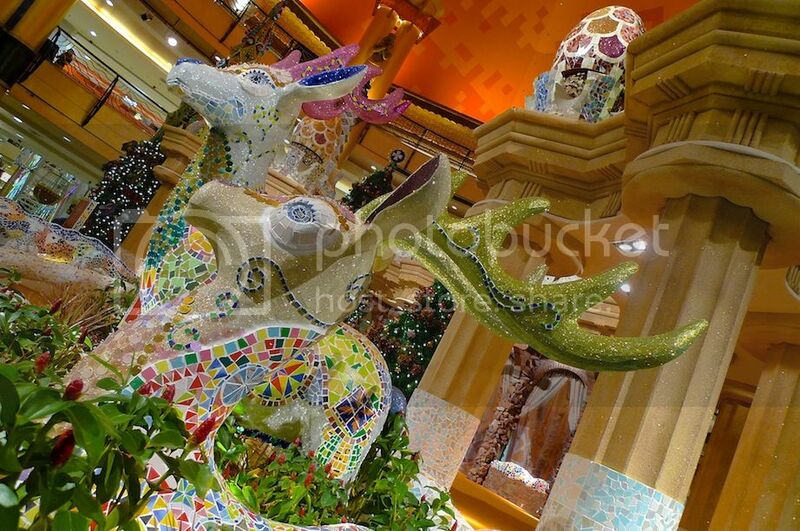 It did enthrall me with its colorful and intricate designs of mosaic arts. 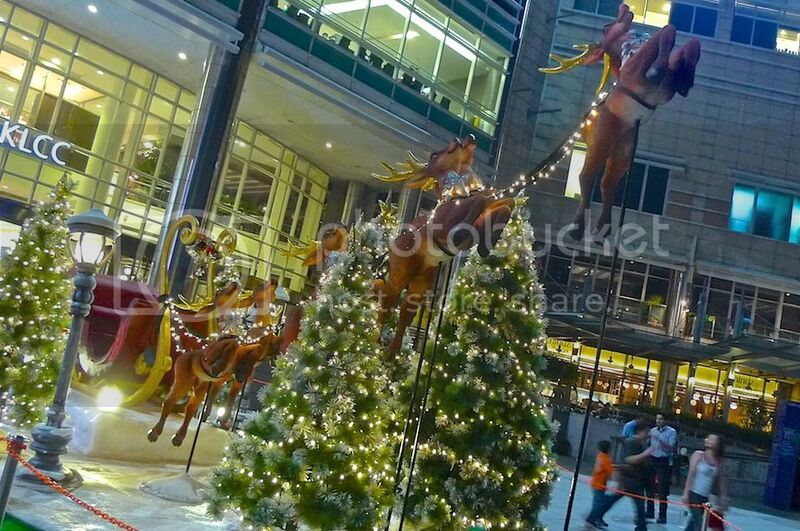 Look at this lovely pair of reindeers! But what is this lizard doing there? 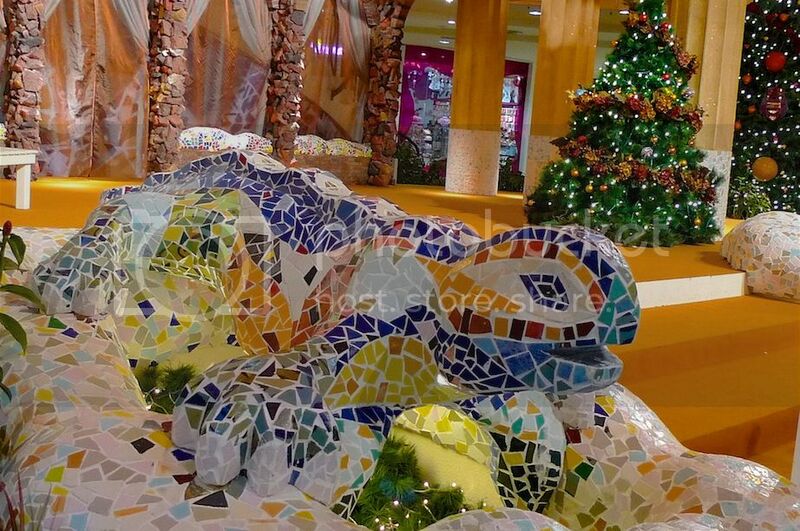 Well, the sprawling lizard sculpture is a reference to the legends of the mystical dragons, as Christmas is filled with magical and spiritual elements that embody the festivity. 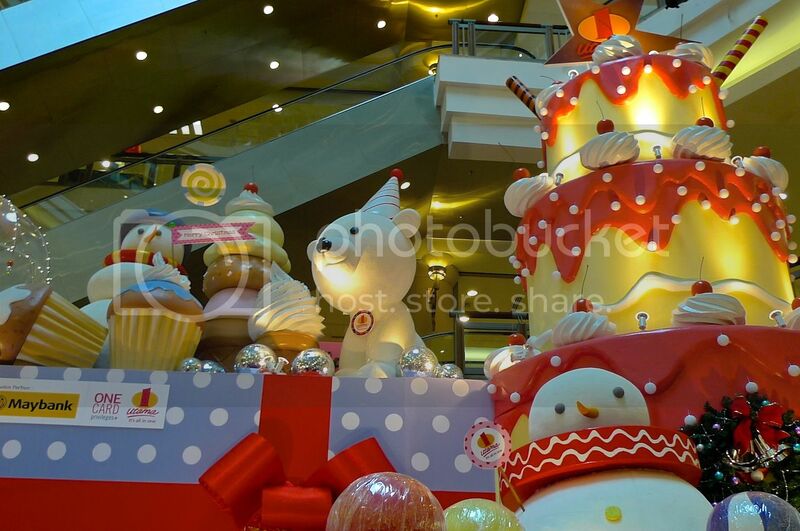 How do you like the Christmas decorations here? 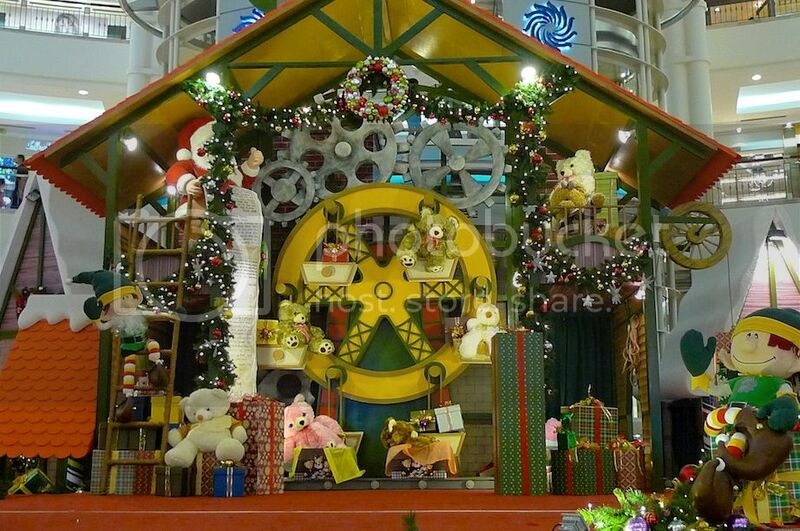 Outside Sunway Pyramid, the Christmas decorations continue to put a spell on shoppers and visitors. 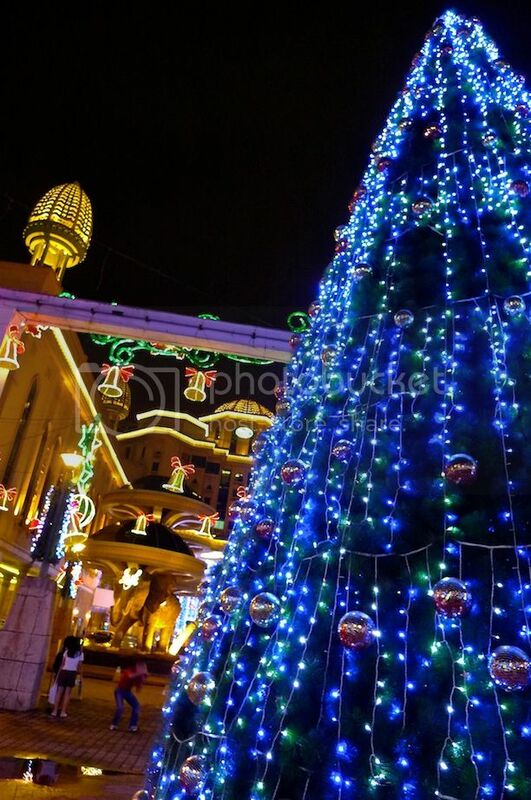 The beautiful lights and decorations outside Sunway Resort Hotel and Spa were quite stunning. 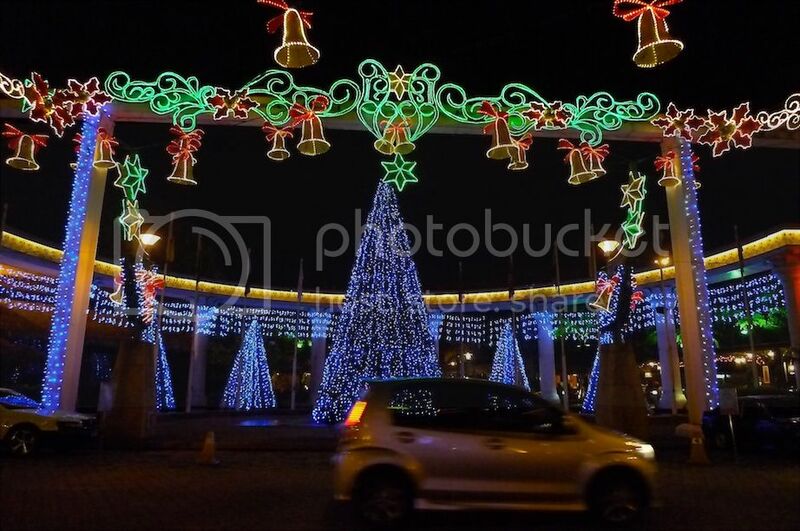 Every Christmas season, this street has never failed to attract loads of visitors! 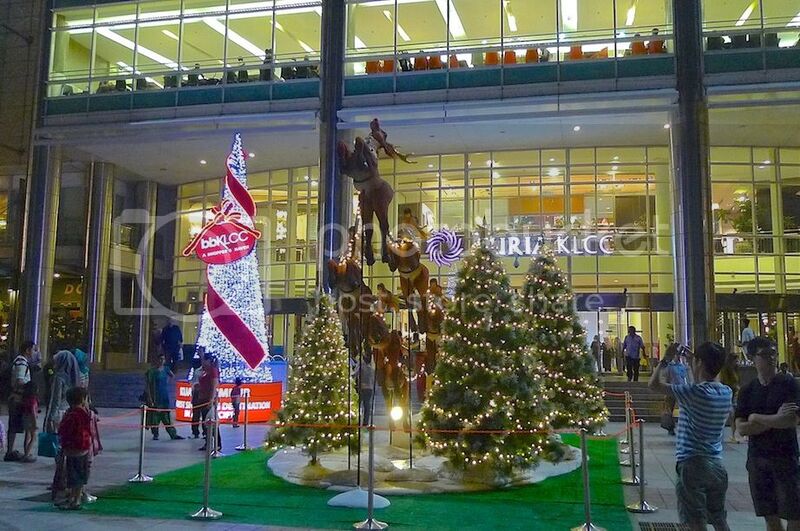 Suria KLCC had been a huge disappointment in their Christmas decorations since they did away with that giant and tall Christmas tree years ago. 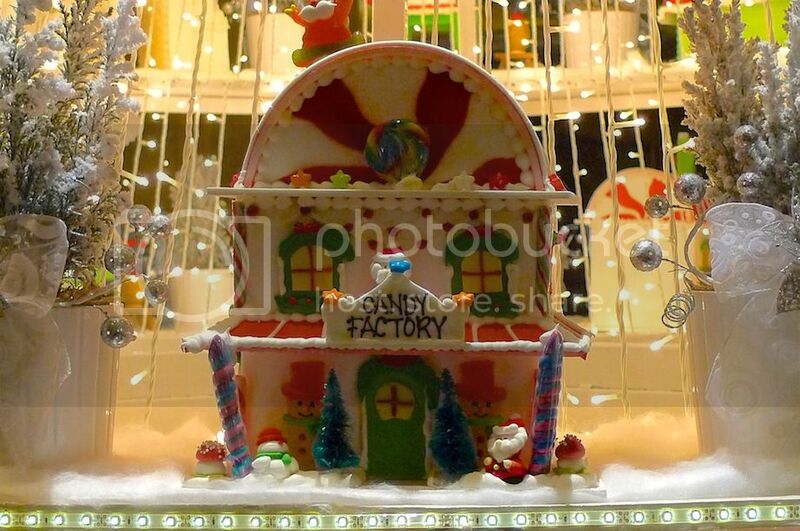 But this year, they were surprisingly pretty good! 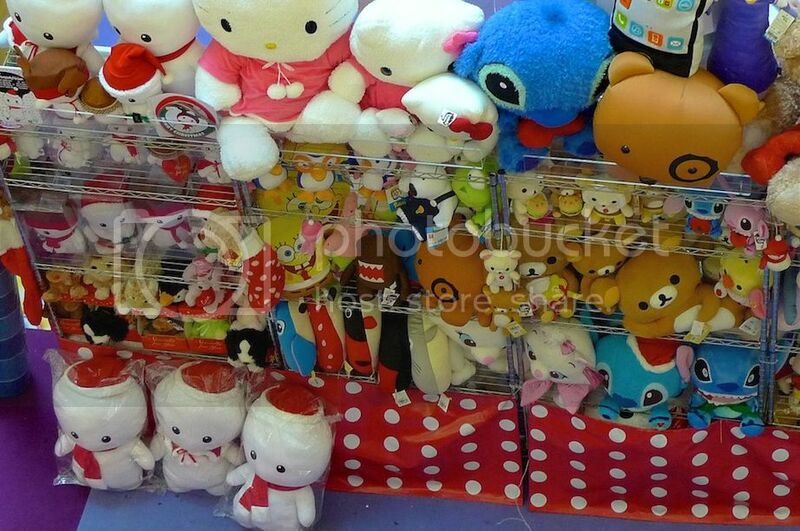 Look at all those plush bear toys! 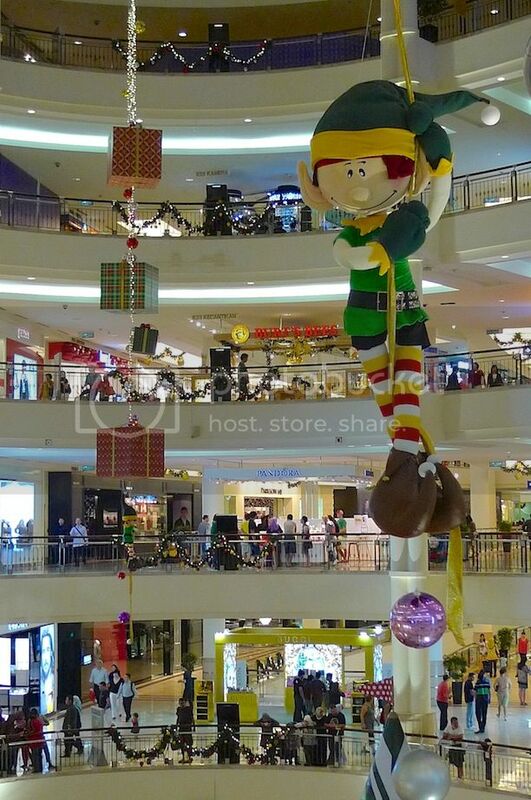 An elf hanging from the ceiling! 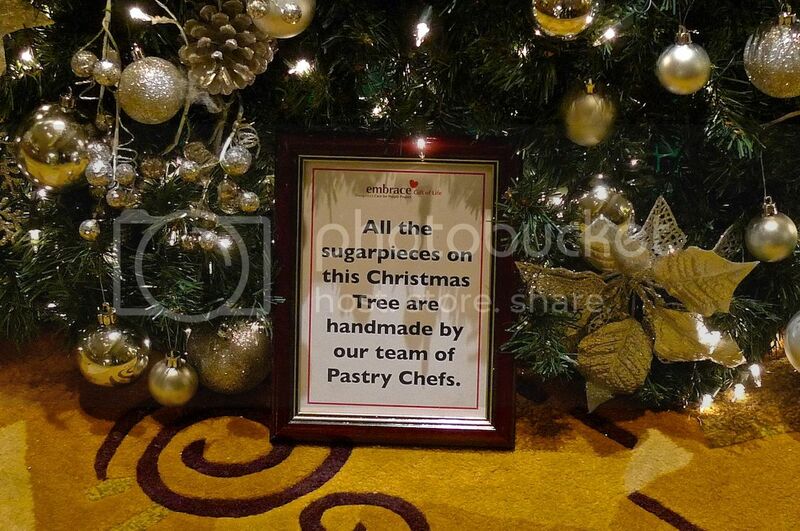 Together with lots of Christmas presents too. 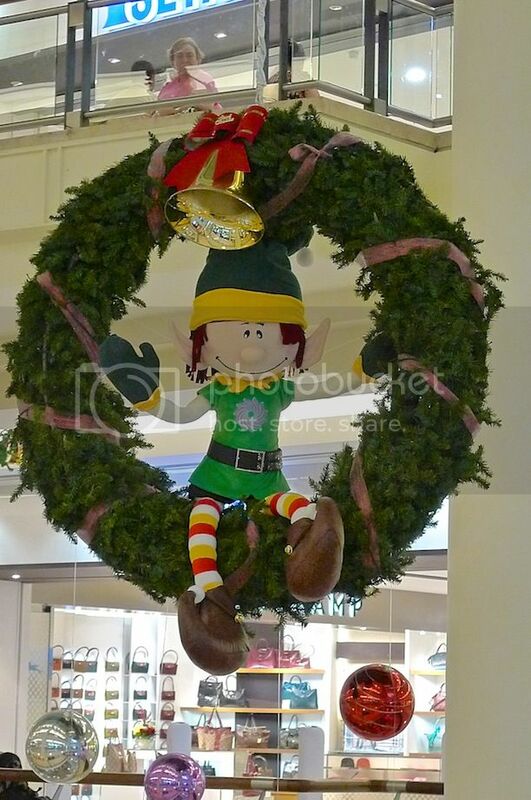 Another elf sitting on the Christmas wreath. 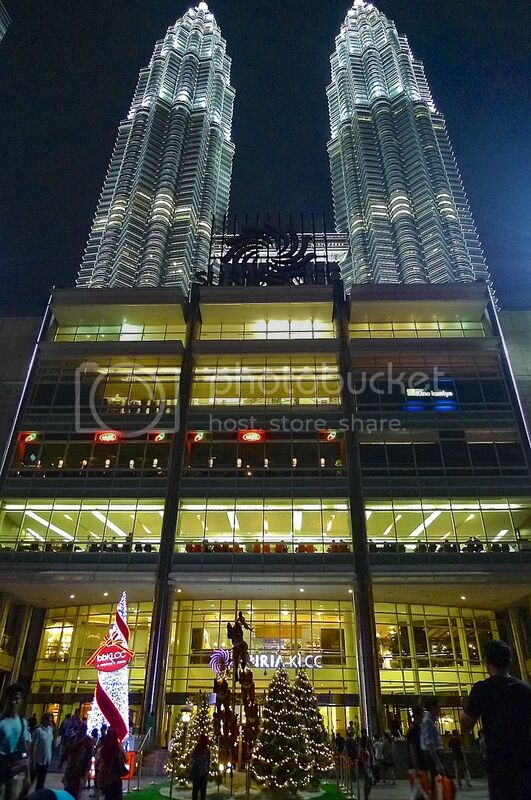 However, the main attraction this year was not inside Suria KLCC but outside at the esplanade facing the Lake Symphony. 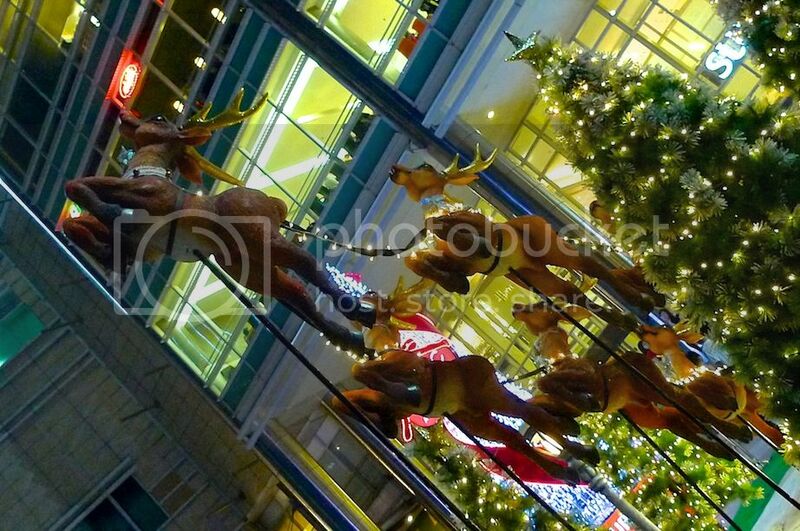 Here, they have a carriage and reindeers flying into the sky. It looks pretty magical although my photo probably did not do it much justice. There were many people taking photos here that night. 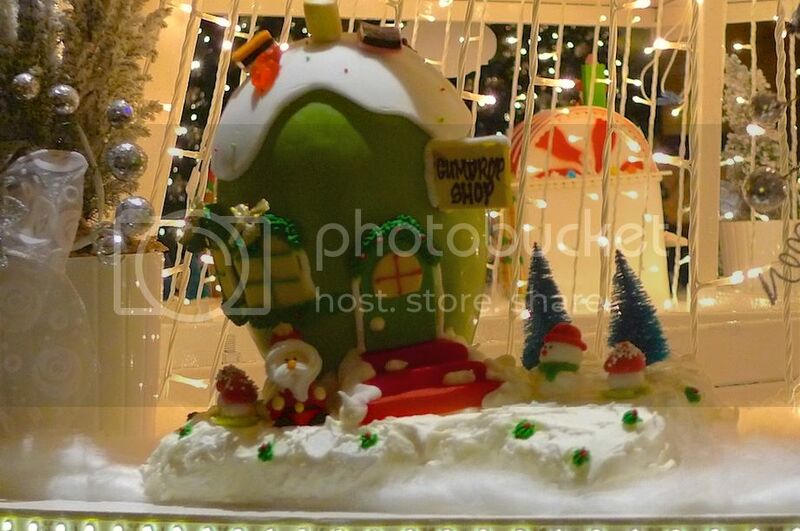 The atmosphere was pretty festive! 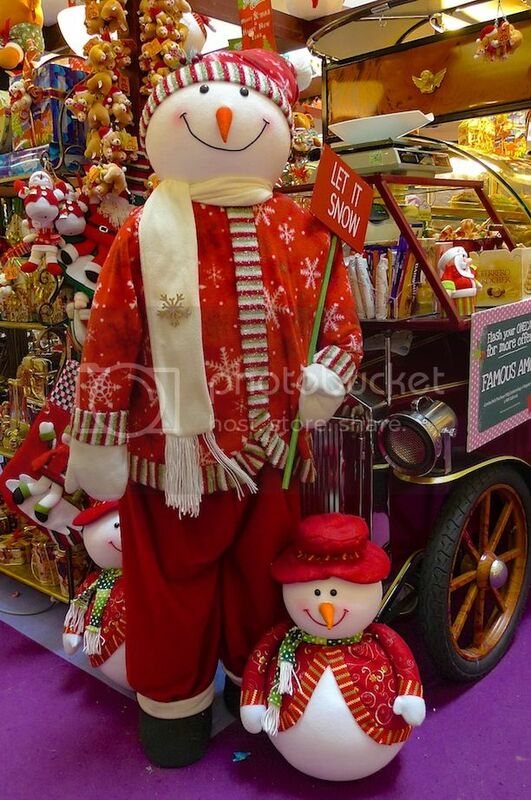 An elf was seen standing behind the carriage. 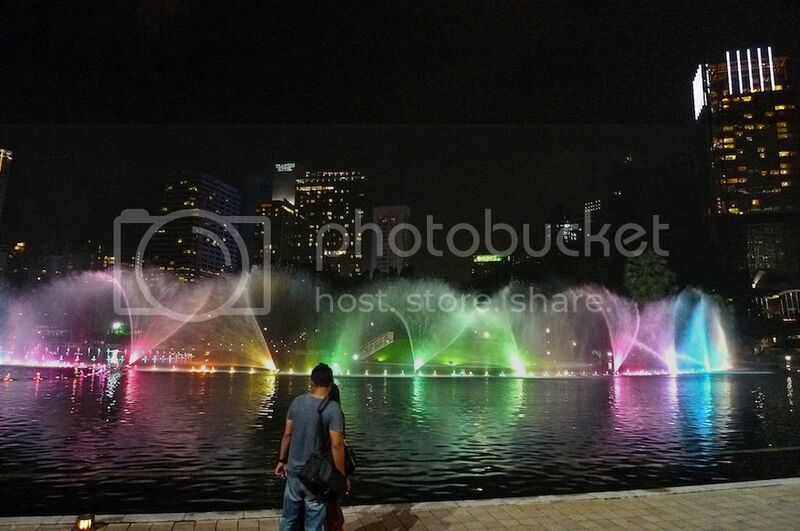 The magical atmosphere was upped a notch with the colorful dancing water symphony. 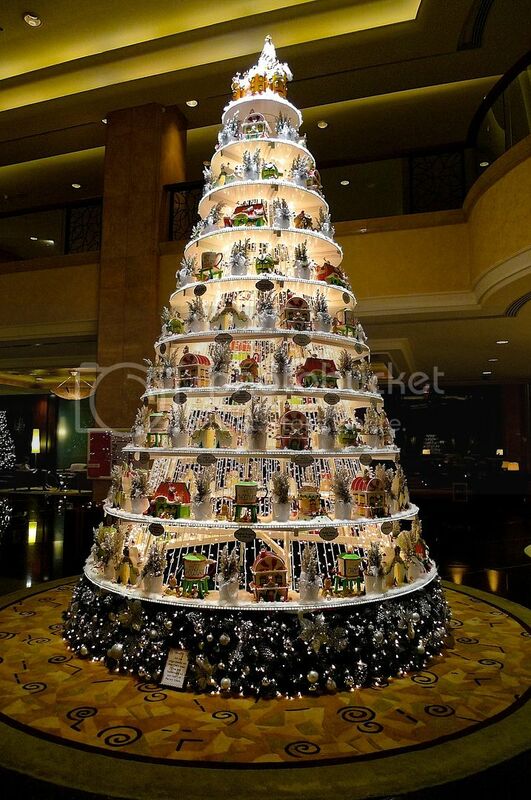 Besides shopping malls, I also made a visit to Shangri-la Hotel in KL to check out its delightful Christmas tree. 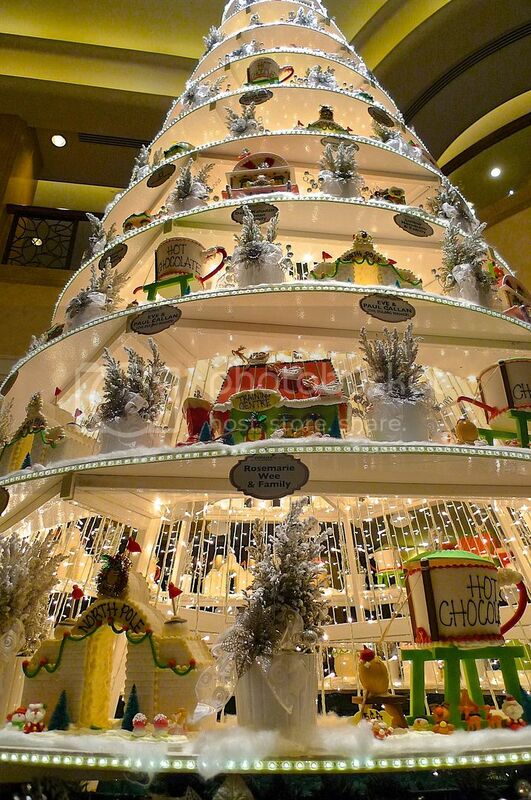 This Christmas tree looks delicious! At the bottom of the tree I found this notice. 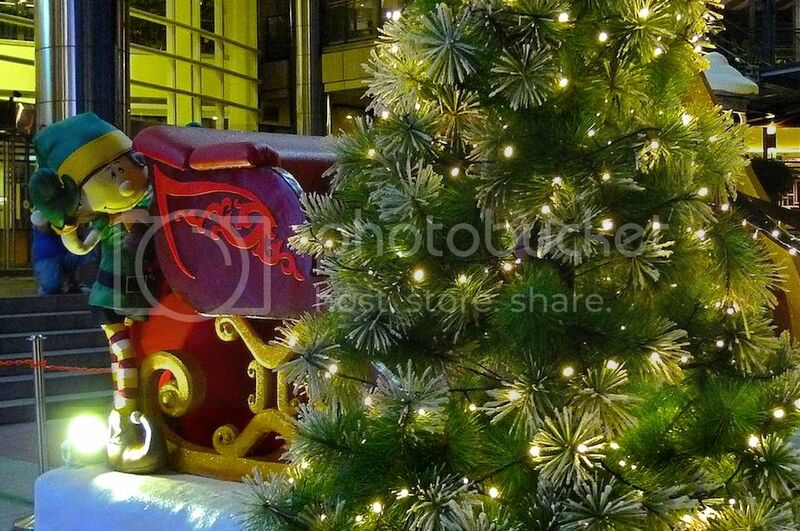 A training centre for Santa's helpers? Aren't they cute? 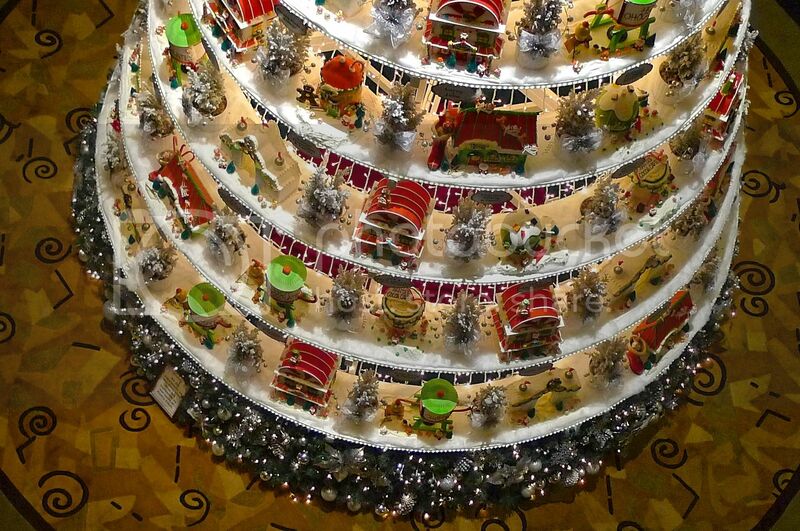 All these sugarpieces can be found on every level of the Christmas tree! 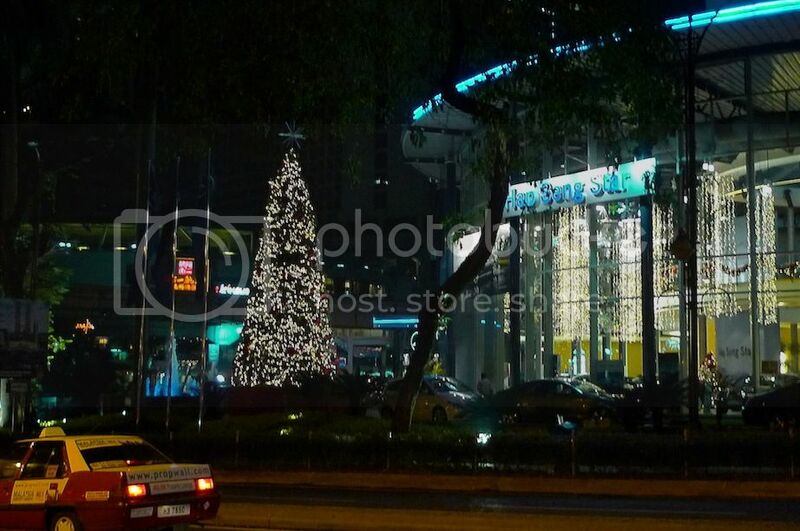 A stone's throw away from Shangri-la Hotel is the Hap Seng Star building. 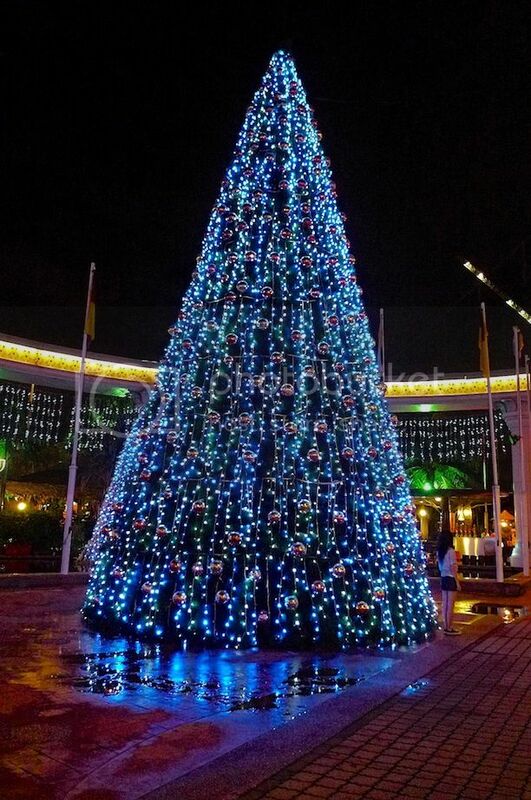 There was a beautiful and tall Christmas tree in front of the building! 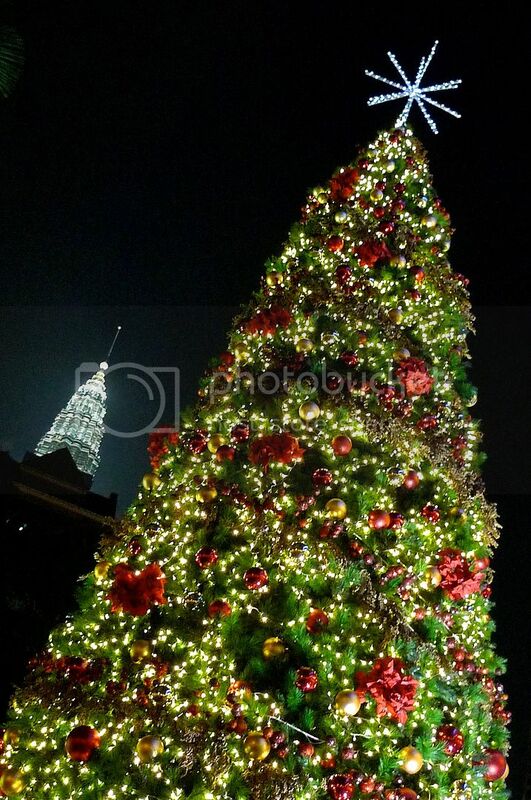 The bright Christmas tree with one of the Petronas Twin Towers in the background. 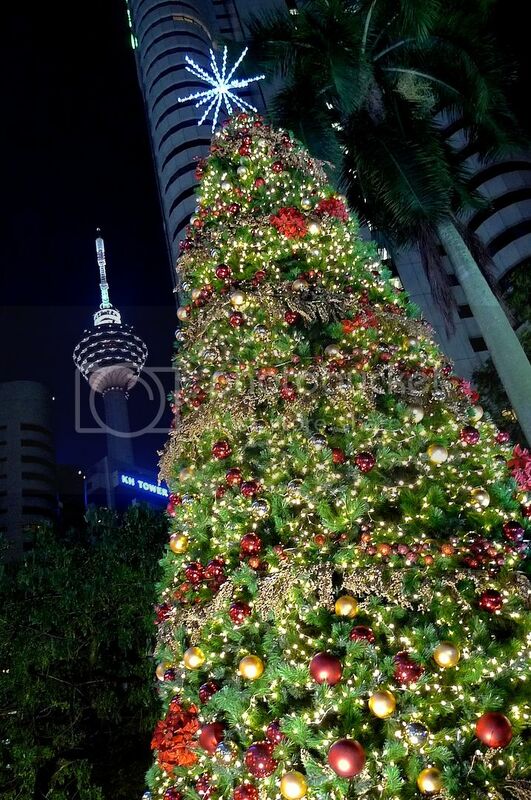 At another angle, you can see the KL Tower setting the backdrop for this beautiful Christmas tree. 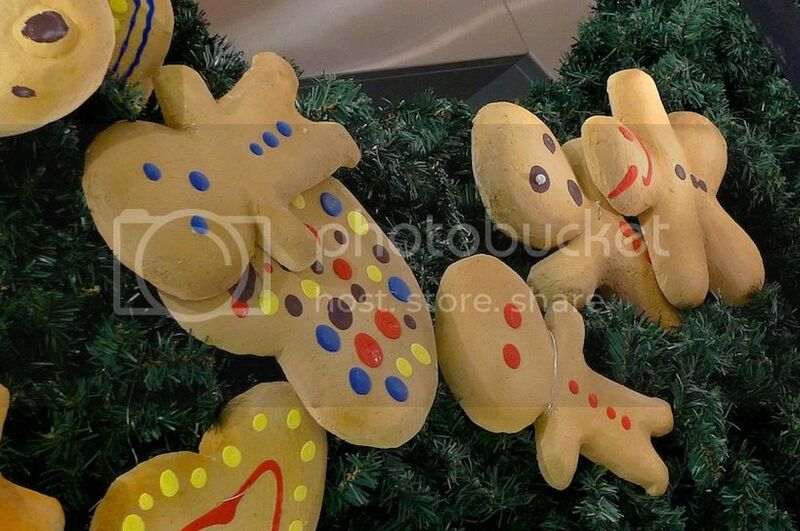 Even though Christmas Day is already over, I can't help still feeling Chrismassy. 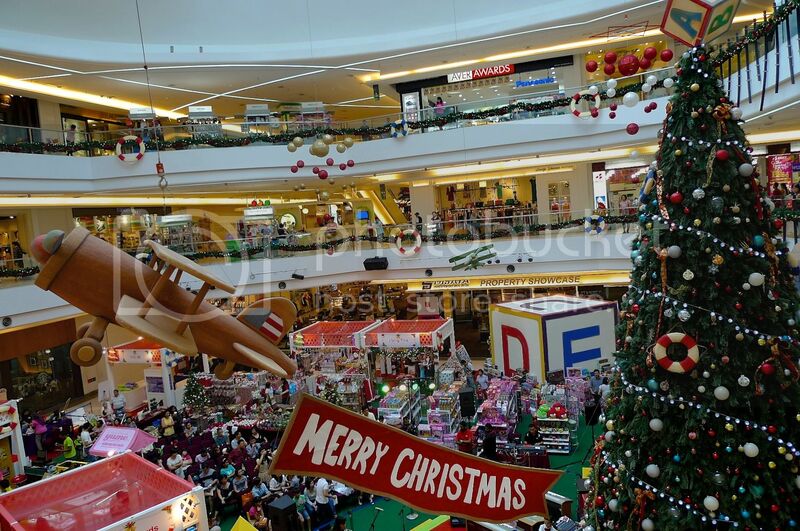 I hope the Christmas decorations all around Klang Valley would not be taken down till the New Year! 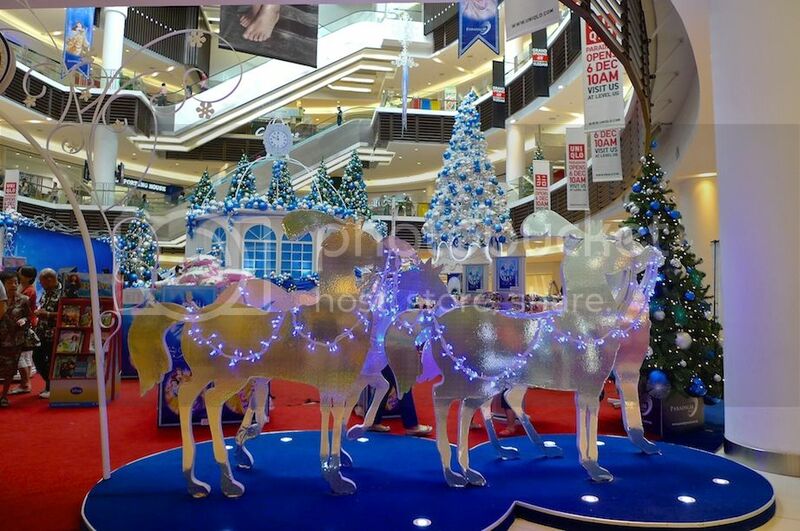 Since it is Christmas Day today, I thought I had better continue with the 2nd part of 2012 Christmas Decorations in Klang Valley. 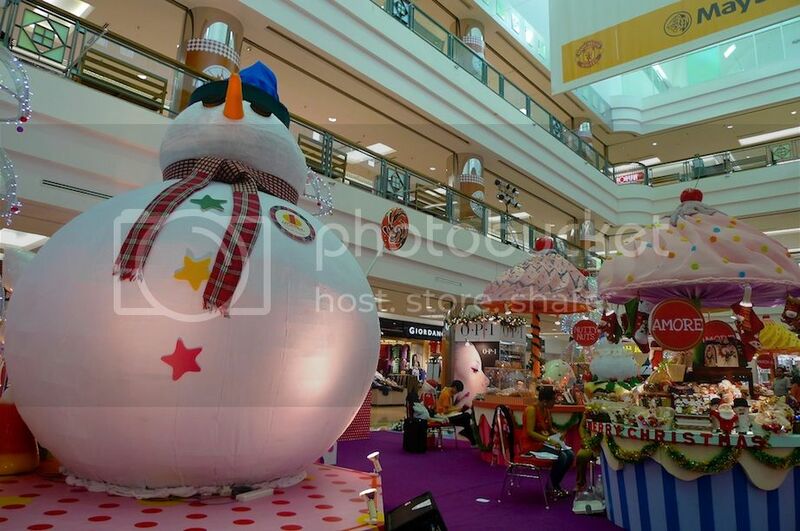 To see the Christmas decorations at Pavilion KL, Farenheit 88, Starhill Gallery and Berjaya Times Square, read Part 1. 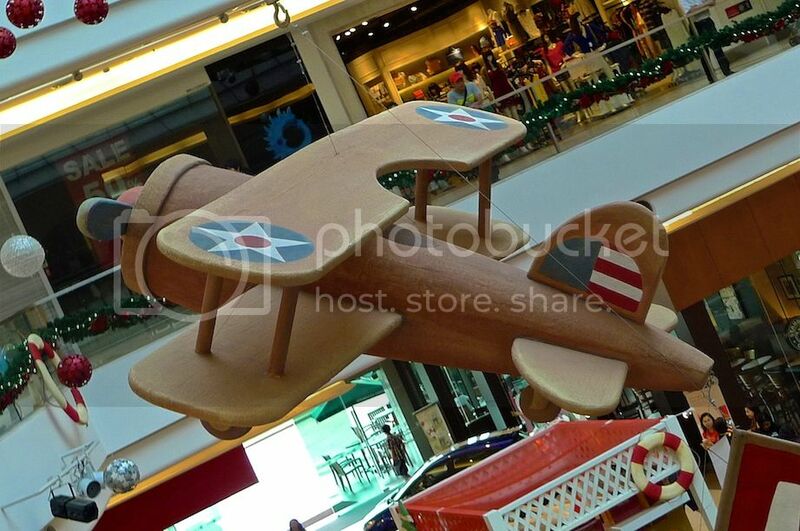 The Christmas decoration at 1Utama shopping mall was pretty interesting this year. 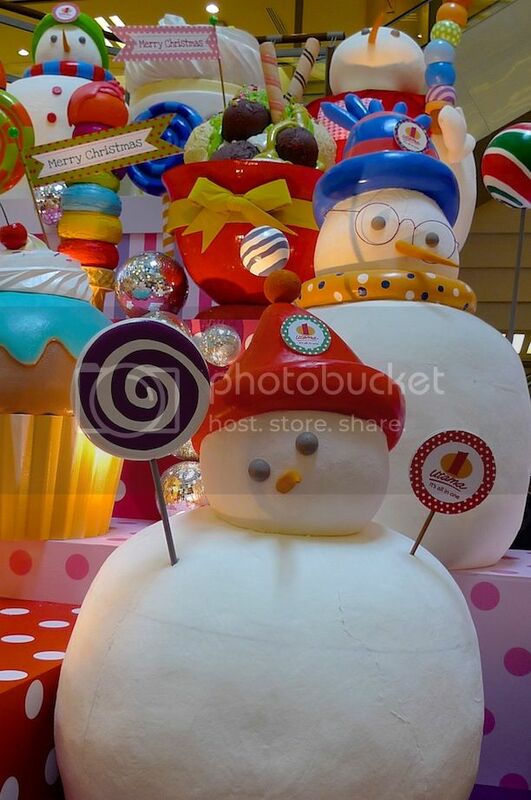 Cute snowmen, bears, cakes, candies and ice cream galore! 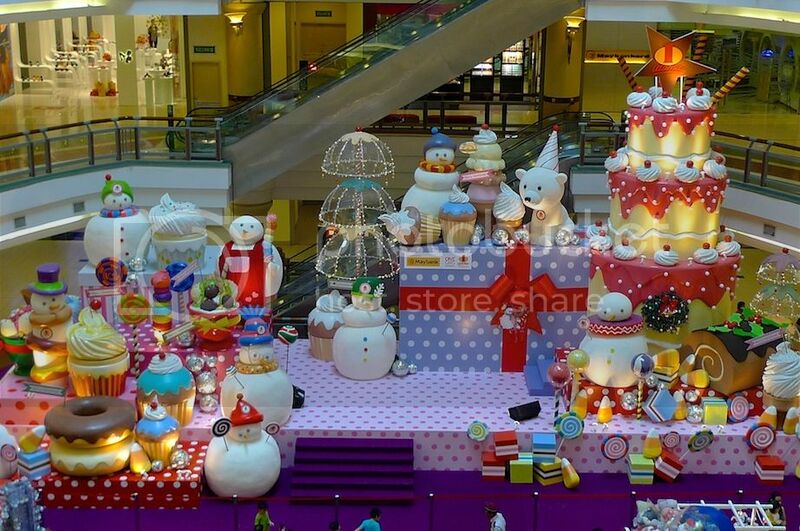 This is at the Oval area in 1Utama. 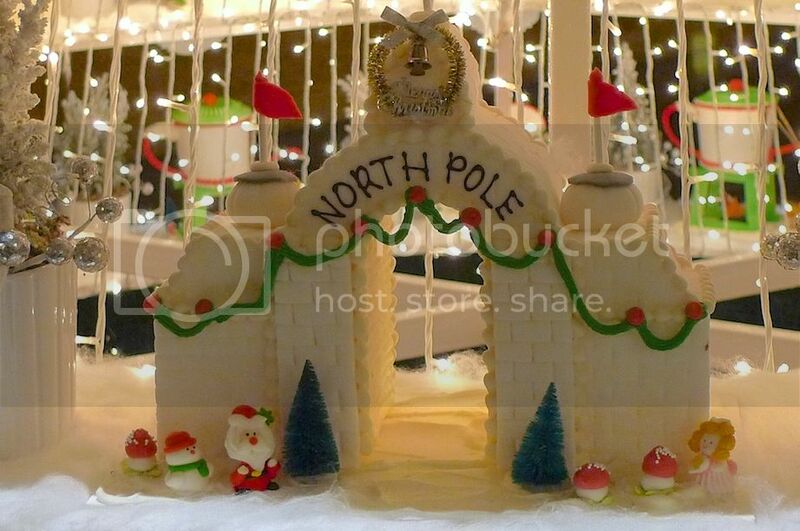 The decoration this year was much better than last year. 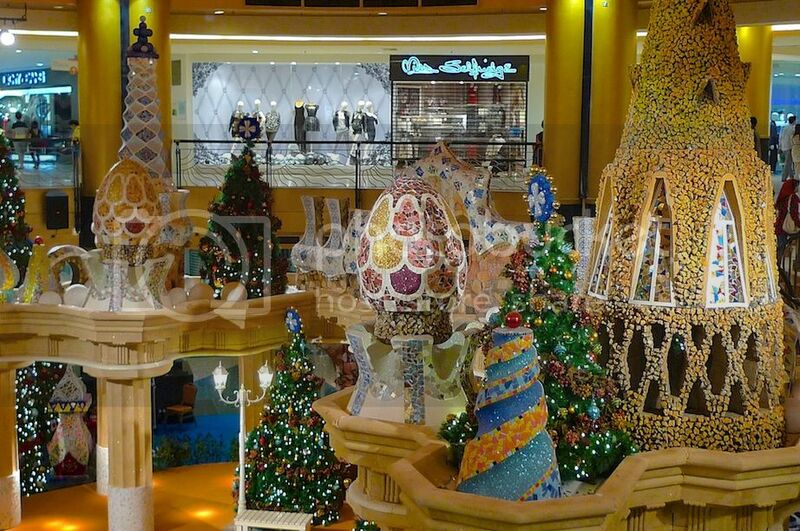 To compare, have a look at last year's Christmas decoration HERE. 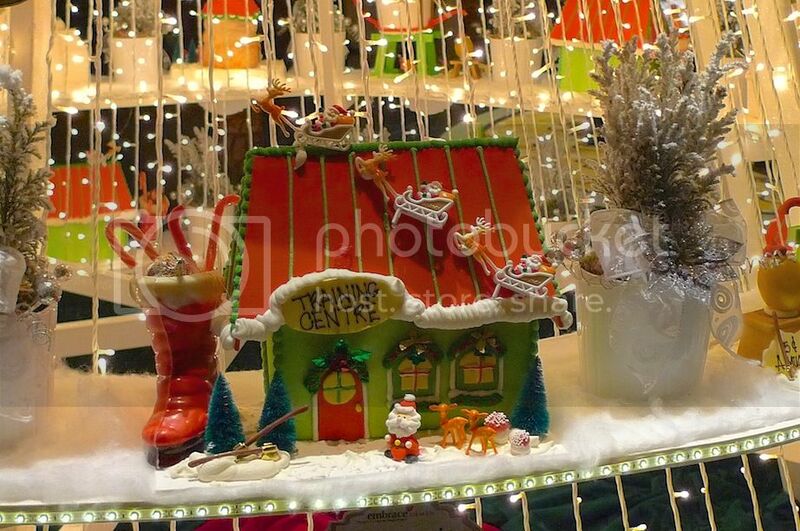 The decoration gave me a really festive feeling! 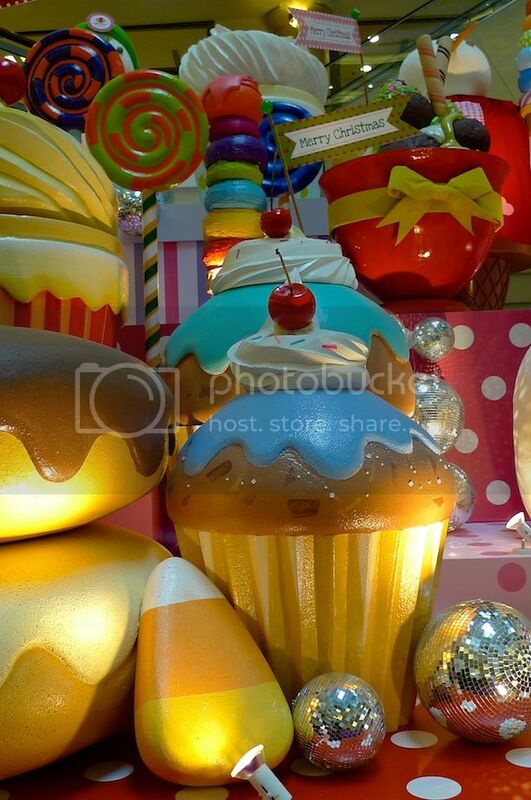 Cupcakes, donuts and lollipops to sweeten your Christmas mood! 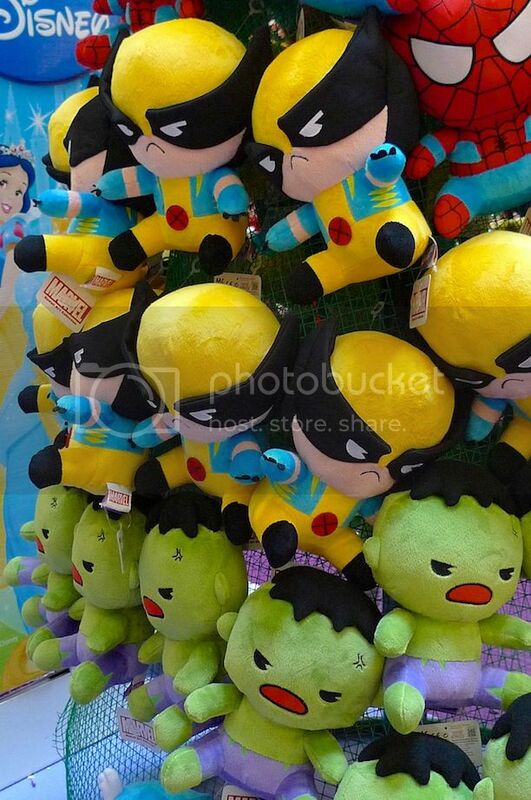 Look at these Marvel Kawaii plush toys on sale! I almost wanted to buy them. So cute! But I thought the better of it cos I had already burnt a huge hole in my wallet on a Christmas shopping spree a few days earlier! But wait... 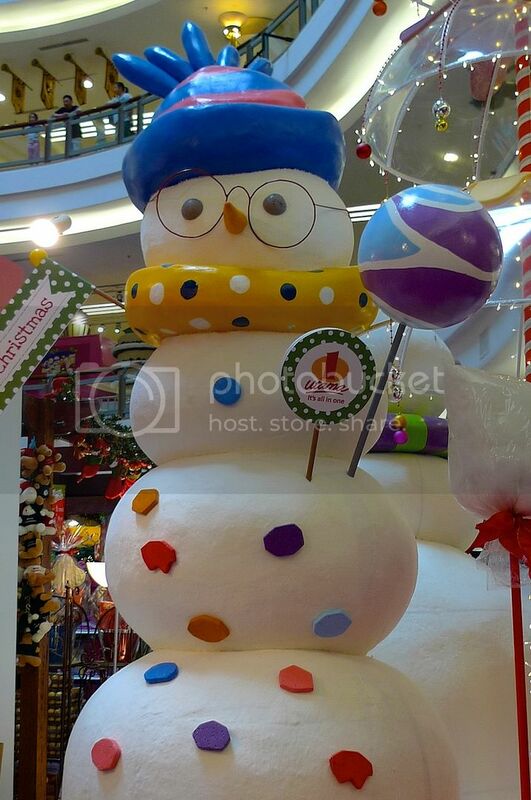 I thought I have seen this adult snowman at Mid Valley in 2010! Check it out HERE. 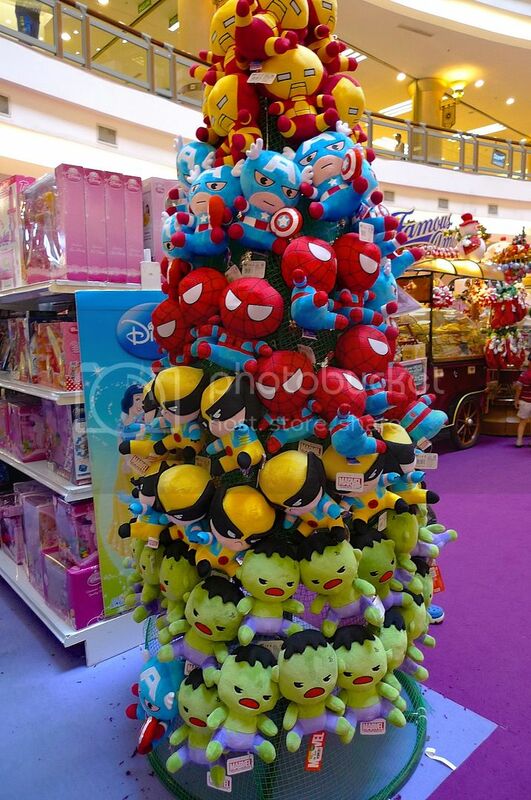 So many cute toys and plushies on sale! 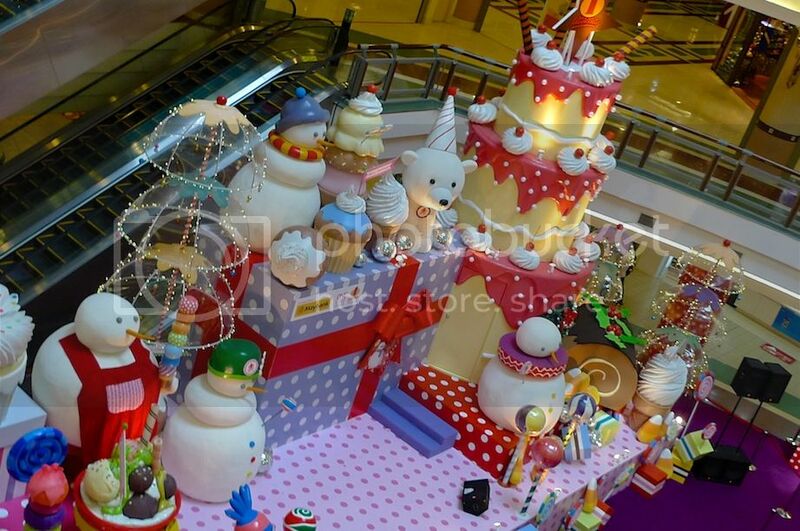 I want that Rilakkuma bear! 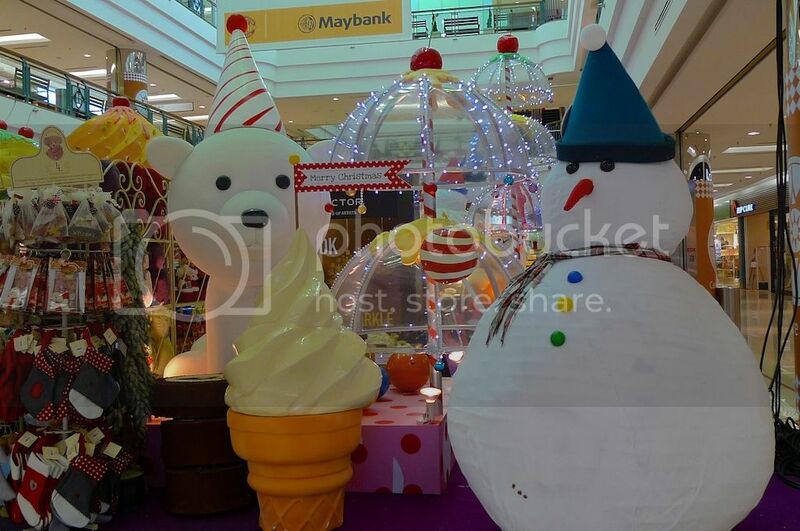 The Oval area was not the only place in 1 Utama with interesting Christmas decorations. 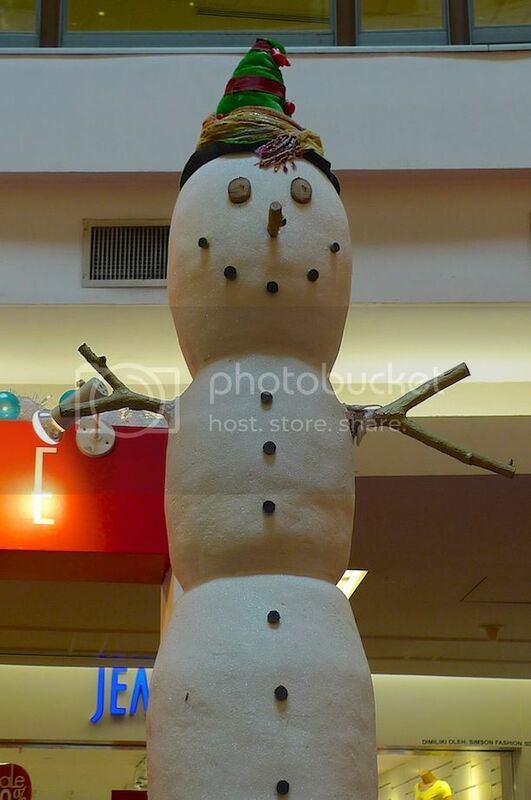 Somewhere in the Old Wing (I now called it the New Old Wing), I could see a huge, fat snow man. 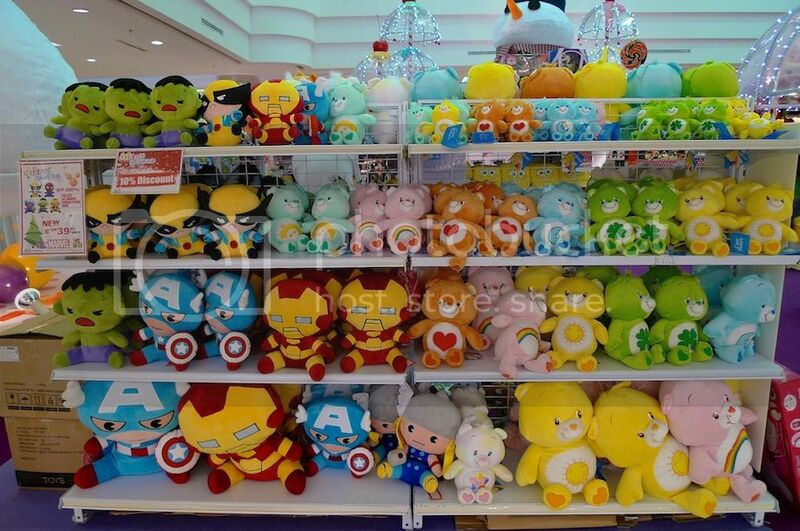 And more Marvel Kawaii plush toys on sale! How could I even control my spending? Cute bear! 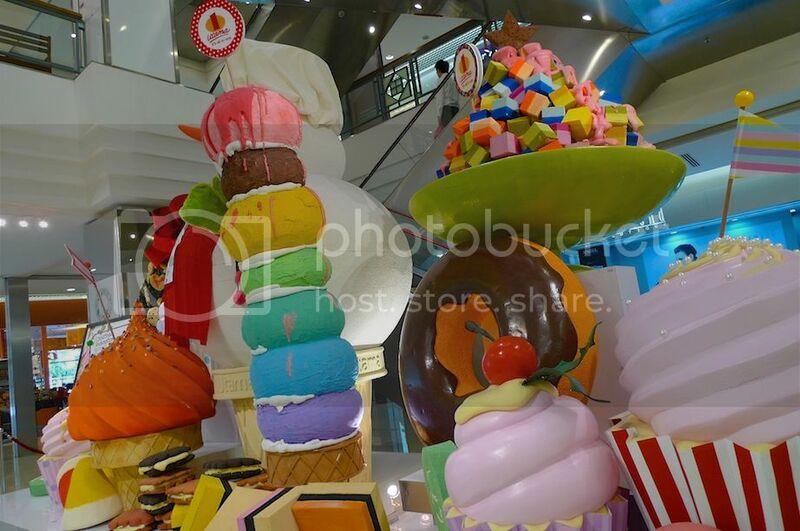 That ice cream cone makes me drool. 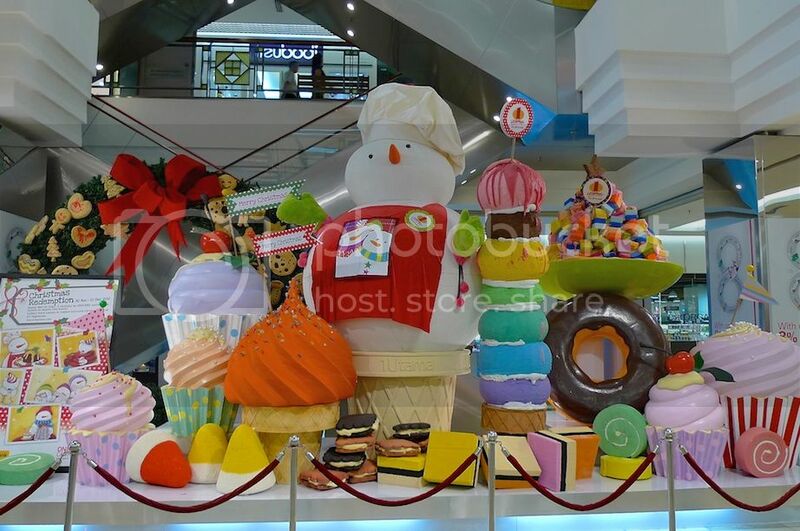 Somewhere near Jusco I found this snow man chef surrounded by sweet, sinful food. 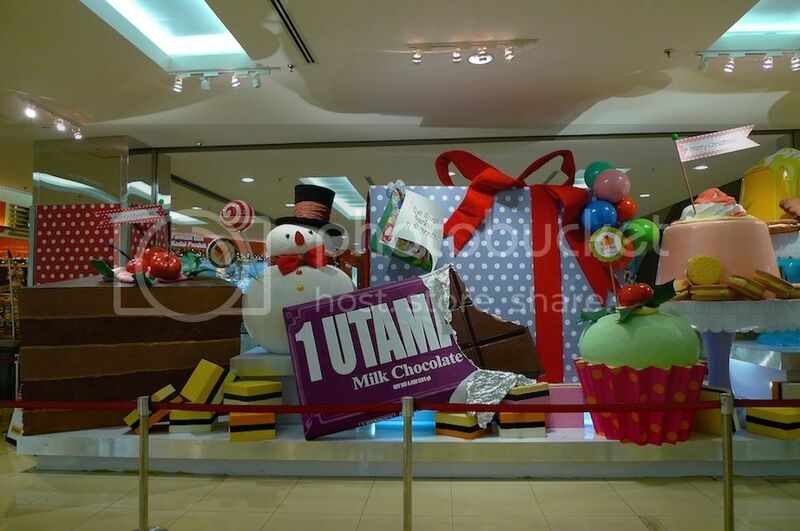 1Utama was surely having a sweet Christmas! 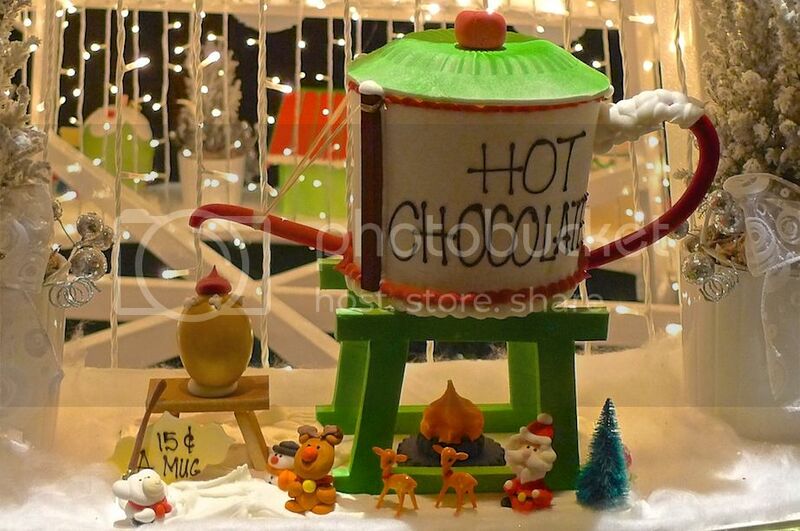 At another area near Lavender Bakery, I saw a giant half-eaten chocolate bar and a yummy chocolate cake! 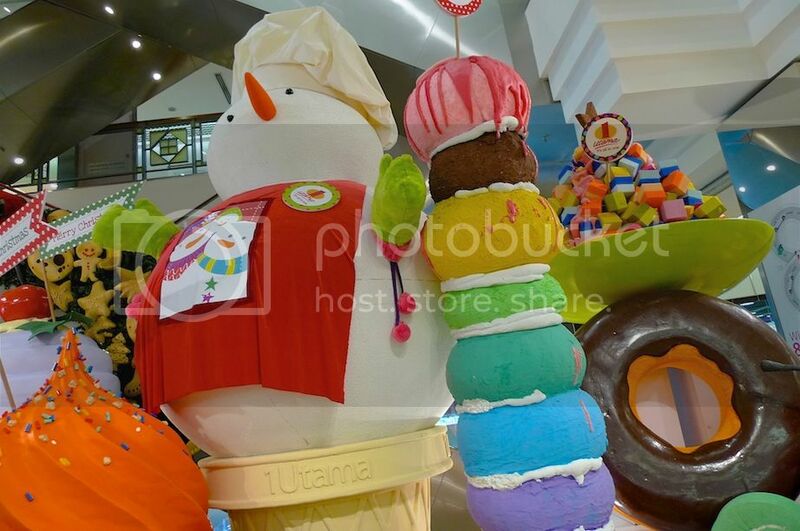 How do you like the Christmas decorations at 1Utama? 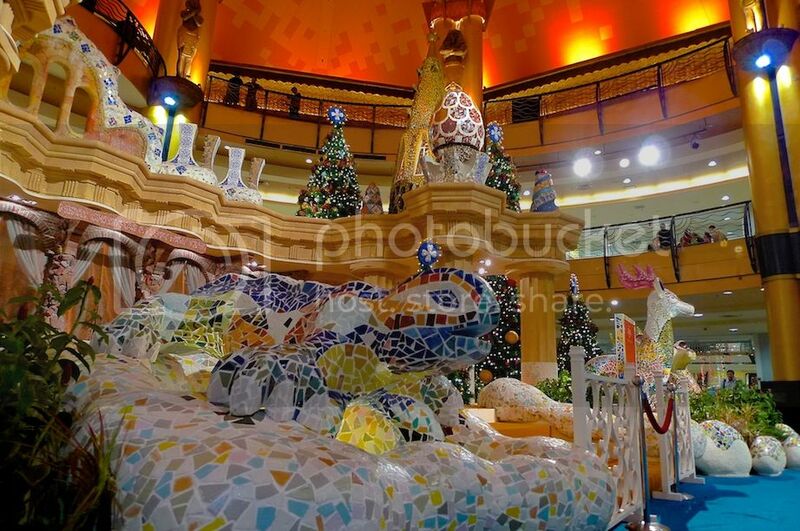 I like the Christmas decorations at Tropicana City Mall this year. 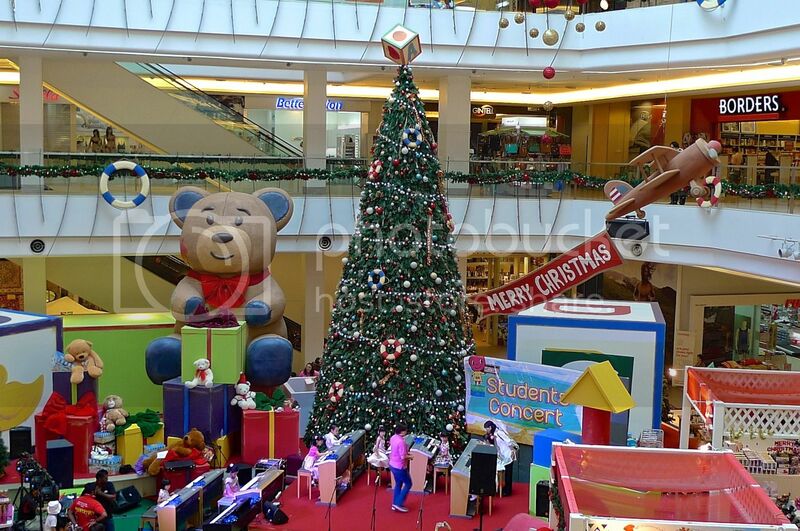 There's a huge bear, a Christmas tree and and a plane. 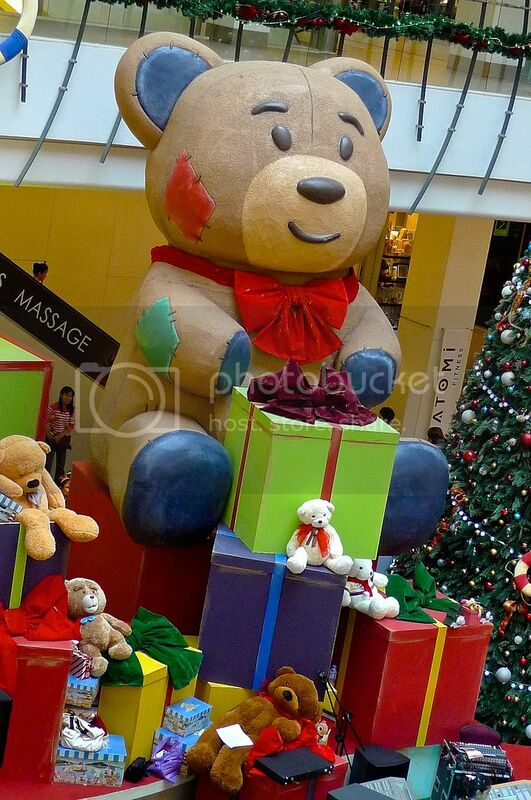 There were smaller plush toys surrounding the giant bear. 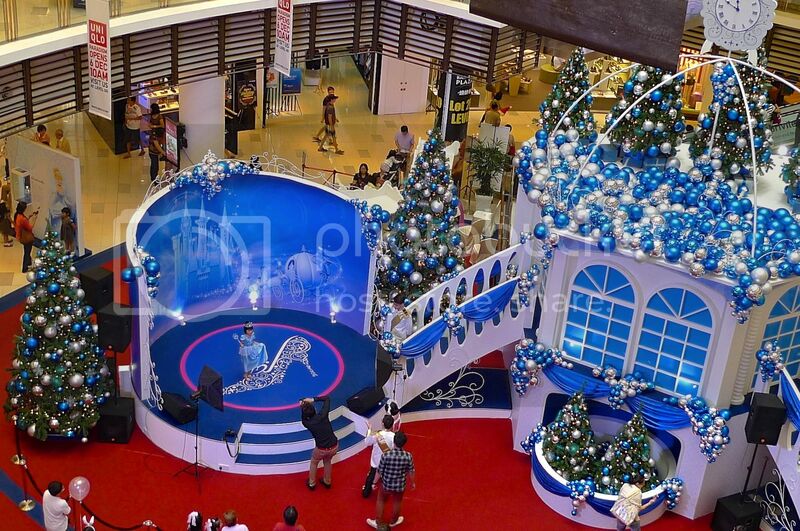 It was a blue Christmas at Paradigm Mall. 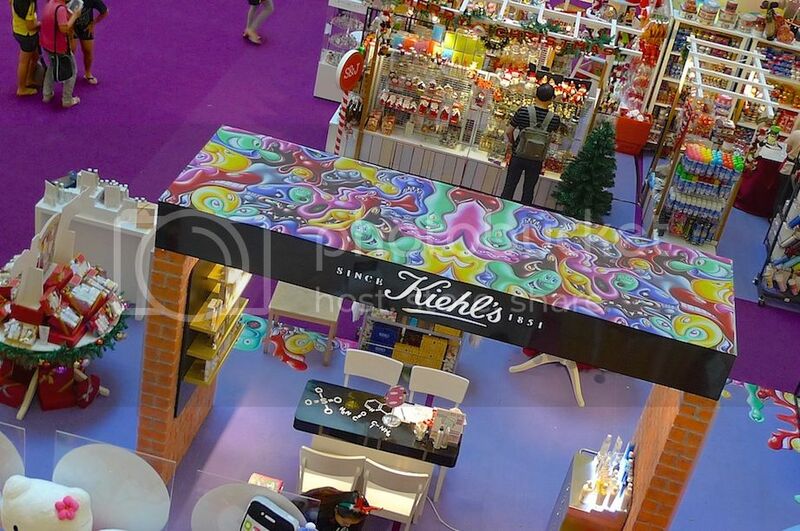 They have built a structure with stairs and a clock at the rooftop. 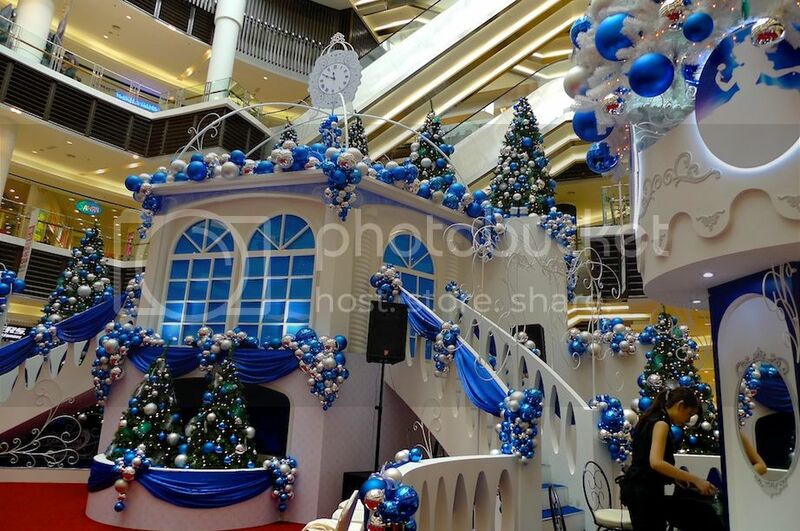 Maybe I was attracted to this decoration because of the color blue, which is my favorite color! 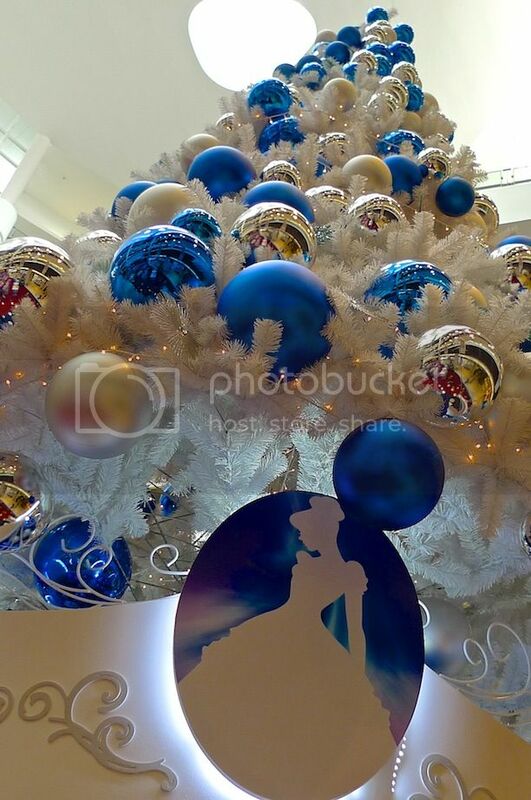 The Christmas tree was really beautiful! It gave me a magical feeling. 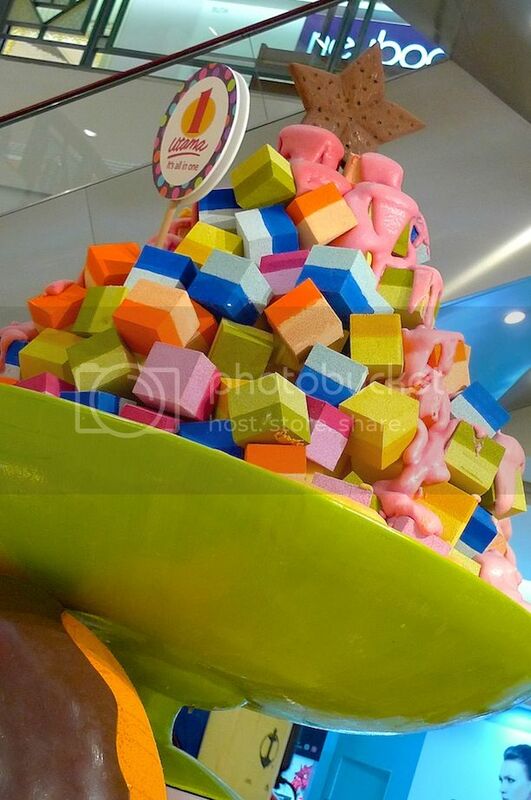 Looks like this post is getting a bit too long and I have yet to cover KLCC and Sunway Pyramid! So don't miss Part 3 coming up soon!